(Photo: REUTERS/ Christinne Muschi)Demonstrators protest against Quebec's proposed Charter of Values in Montreal, September 14, 2013. Thousands took to the streets to denounce the province's proposed bill to ban the wearing of any overt religious garb by government paid employees. 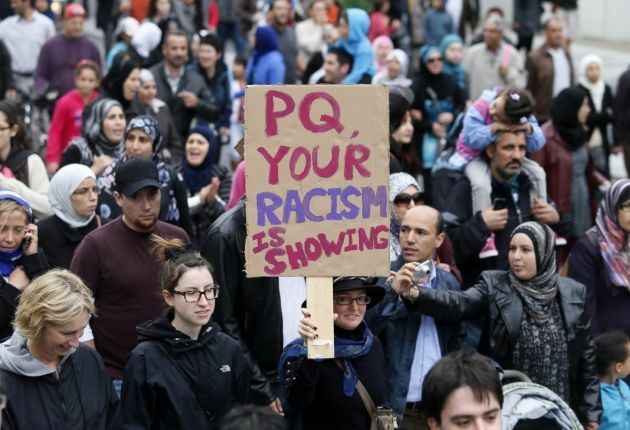 The Canadian province of Quebec has introduced legislation that would bar public servants in positions of "authority" from wearing religious symbols at work. The center-right Coalition Avenir Quebec's bill covers judges, prosecutors, police officers, teachers, and some other positions, the BBC reported. It is not the first time Quebec has proposed legislation on the ground of re-enforcing State religious neutrality. The bill would forbid future government employees from expressing their faith through religious symbols during office hours. The proposed legislation called "An act respecting the laicity of the state," was introduced March 28 and is expected to pass, Catholic News Agency reported. "The purpose of this bill is to assert the secularity of the state and to specify the requirements that flow from it," said Simon Jolin-Barrette, Quebec's Minister of Immigration, Diversity, and Inclusiveness, the architect of the bill at a legislative session last week. The legislation would ban religious symbols for government employees, including Muslim headscarves, Jewish yarmulkes, and crucifixes. The public servants who would be affected include teachers, police officers, and judges. Current government employees in Quebec would be exempt from the ban. Political and religious leaders have condemned the bill calling it an act of discrimination and an affront to religious freedom and Canada's prime minister has also opposed. "It is unthinkable to me that in a free society we would legitimize discrimination against citizens based on their religion," Prime Minister Justin Trudeau told journalists. The Catholic Archdiocese of Montreal issued a statement, saying that the crucifix represents the Christian roots of the country and does not need to be removed in a religiously pluralistic society. "As a sign revered by Christians, the crucifix remains a living symbol. It symbolizes openness and respect toward all peoples, including toward other faith communities and religious traditions, which rightfully adhere to their own signs and symbols," said Archbishop Christian Lépine. Rabbi Reuben Poupko, Quebec co-chair of the Centre for Israel and Jewish Affairs, said, "We are deeply opposed to the restriction and erosion of the freedom of religion of individuals in the name of secularism." "What right does the Quebec government have to stop my career?" Maha Kassef, 35, an elementary school teacher, said of the proposed law on the display of religious symbols, The New York Times reported. Kassef, an ambitious elementary school teacher, aspires to become a principal. But since she wears a Muslim head scarf, she may have to put her dreams on hold: A proposed bill in Quebec would bar public school principals, and other public employees, from wearing religious symbols. "How am I supposed to teach about respect, tolerance and diversity to my students, many of whom are immigrant kids, when the government is asking me to give up who I am?" asked Kassef, the child of Kuwaiti immigrant parents who worked tirelessly to send her and her four siblings to college.